Puthia Temple Complex consists of a cluster of notable old Hindu temples in Puthia Upazila, Rajshahi Division, Bangladesh. Located 23 km to the east of Rajshahi city, it has the largest number of historic temples in Bangladesh. 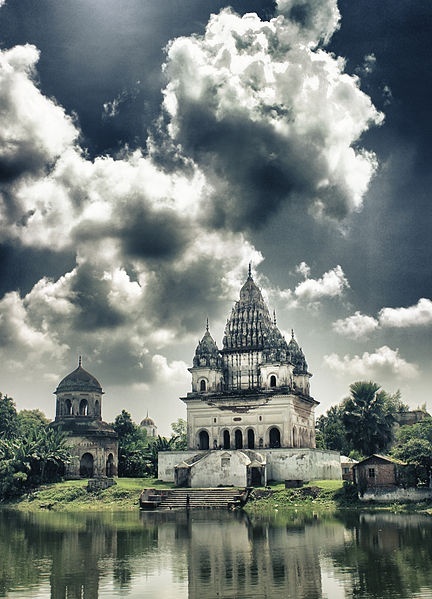 The temples were built by Hindu Zamindars Rajas of the Puthia Raj family who were noted philanthropists of Rajshahi. The temples have been built in terracotta in a variety of styles combining the typical Jor-bangla architecture with other influences. The Rajbari or Palace of the Raja of Puthia and the Dol Mancha is part of the complex. The temples are laid out around a lake with a sprawling lawn.